We are confident that this worm did not come from our reader’s body. 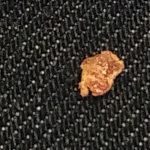 While there are intestinal parasites that are can be present in human feces, they don’t look anything like this creature. 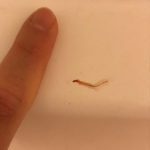 Parasitic worms are usually tiny enough that they are barely visible to the naked human eye! We believe the specimen our reader found is an earthworm and did not come from her body! That being said, if our reader is truly worried about her health or experiencing symptoms of any kind, then we recommend she visit a doctor! Since we aren’t medical professionals, we are not licensed to give medical advice. 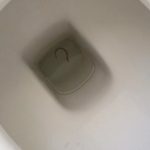 Assuming we are correct in our identification and this is an earthworm, how did it end up in our reader’s toilet? 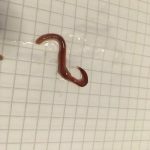 Despite readers finding earthworms in their toilets fairly regularly, we still haven’t quite cracked the code on how they get there. We think the most probable scenario is that they end up in toilets by means of the pipes. Earthworms live underground in moist soil, but when it rains a lot the soil becomes over saturated and the worms use the wet conditions to travel to new locations. 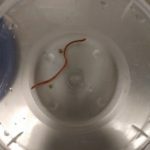 It is possible that an earthworm snuck in through a small gap or crack in the pipes and wound up in our reader’s toilet bowl. 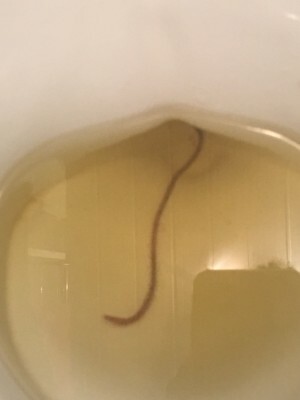 As long as this is the first and only worm our reader has found in her toilet, we don’t think she should worry about the potential crack in her plumbing system. She can just place the worm back outside near some soil to burrow into. On the other hand, if she has found numerous worms in her toilet, it would probably be wise for her to hire a professional to look into her pipes and plumbing system. 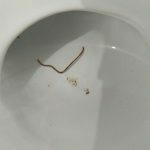 Luckily earthworms are friendly worms and their occasional presence in our reader’s toilet shouldn’t cause any problems. They aren’t known to carry or transmit any human diseases, and they are extremely helpful when it comes to maintaining a healthy ecosystem! 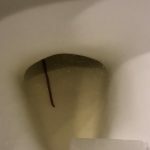 To sum up, we believe the brown worm our reader found swimming in her toilet is an earthworm! We think it probably came from the plumbing system and not from her body! If she is convinced it came from her body, she should see a medical professional ASAP. 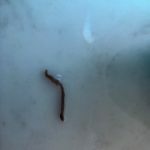 We believe the brown worm our reader found swimming in her toilet is an earthworm! We think it probably came from the plumbing system and not from her body! If she is convinced it came from her body, she should see a medical professional ASAP.